The influence of the electric field on the reaction of fish has long been used both for attracting and subsequently catching fish and for deterring fish from the area. Classic electrical barriers for fish consisted of a set of metal electrodes submerged in water, to which voltage was connected. Voltage was usually supplied by a 50/60 Hz electrical network. The voltage was changed by means of a transformer. With this type of construction, the electric field generated between electrodes was homogeneous, and the amount of electrical energy absorbed by the fish body depended on the size of the fish, the time spent in the inter-electrode area and the intensity of the electric field. This meant that if the voltage of the electrodes produced an electric field which deterred medium and large fish (without electrocuting them), it did not, in turn, deter small fish. Increasing the electric field strength, however, increasing the supply voltage, caused a deterrent effect on small fish, but paralysed both medium and large ones.. The NEPTUN system is a new approach to the generation of electric field in water and its impact on fish. In the NEPTUN system is a method of producing between a set of positive and a set of negative electrodes a growing non-linear electric field in an aqueous environment. Fish flowing down or upstream in the direction of the protected object first reach a row of positive electrodes. Negative electrodes are closest to the protected object. In the area between positive and negative electrodes an electric field is generated, the intensity of which increases as it approaches the protected object. 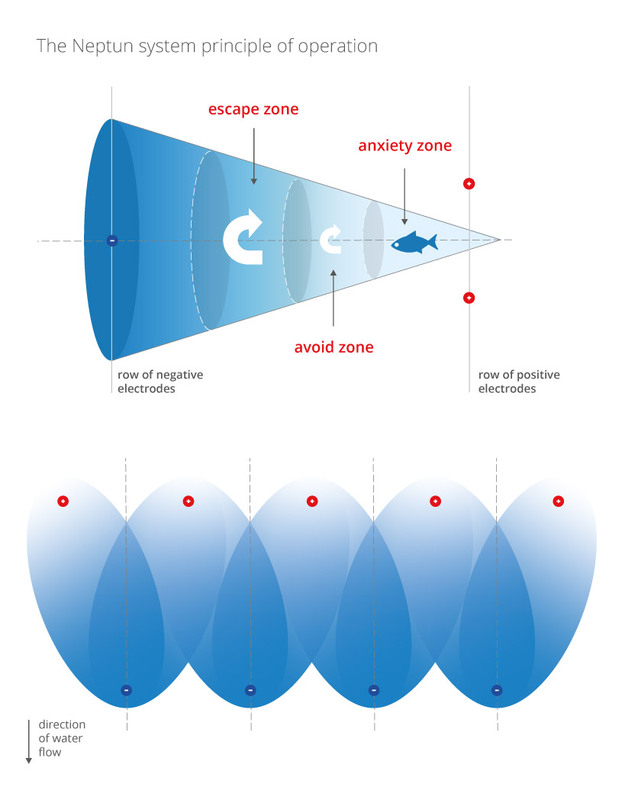 Thus large and medium fish react to the electric field in the vicinity of positive electrodes, whereas small ones react in the middle part of the inter-electrode area or in the vicinity of negative polarized electrodes. Such a field distribution is obtained by applying electrodes of different active area and by proper arrangement of the electrodes in relation to each other. Efficiency of the NEPTUN system is confirmed by numerous inspections and tests. The NEPTUN system is characterized by very high efficiency, reaching up to 100%, depending on the hydrotechnical conditions and species composition of fish found at the system installation site. Such high efficiency, confirmed by numerous studies and tests, could be achieved thanks to an individual approach to system design. 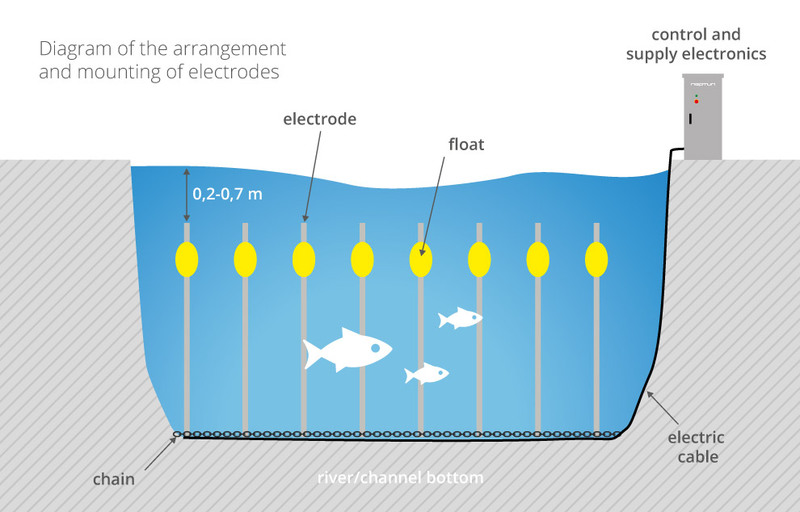 Because the fish body absorbs the most energy when it is set parallel to the force lines of the electric field spreading in the aquatic environment, this calls for a specific position of the electrodes..
A very important element determining the effective and safe for living organisms, including humans, working, is the way electrodes are powered. Selection of the power supply in the form of low voltage current pulses and appropriate selection of parameters such as: pulse duration, frequency and filling factor enable ecological and safe physical impact on fish. The field generated in this way does not paralyse fish, fry and other aquatic organisms and does not negatively affect their reproduction. Adequate selection of parameters and location of positive and negative electrodes reduces the risk of negative impact of the NEPTUN system on humans.